Day 1 – Meet-up early in the morning for our commute to the Aravaipa Canyon West Entrance trail-head. Time and meeting location to be announced. We will hike into the wilderness and set up camp along the creek. Day 2 – Wake-up, have breakfast and spend the day exploring further into the canyon. We will keep the same camp for both nights so there is no need to pack-up or carry all of your gear. Just bring a day pack for your hike through the canyon. There is a small cliff dwelling to explore on the East end of the wilderness boundary along Turkey creek. Day 3 – Wake-up make breakfast and pack-up camp. We will begin our hike out of the Wilderness area. Take your time as you have the full day to exit the canyon. Aravaipa is one of Arizona’s most scenic canyons, with fern draped grottoes, and tall multicolored cliffs. There are numerous archaeological sites including a cliff dwelling along Turkey Creek and several side canyons worth exploring. With springs lining the canyon and trees overhead, Aravaipa Canyon Wilderness is a lush desert riparian with a lot of wildlife. There have been over 200 species of birds spotted within the canyon. Other wildlife includes big horn sheep, coatimundi, ring tail, deer, bear, mountain lion, bobcat, coyote, and javelina. 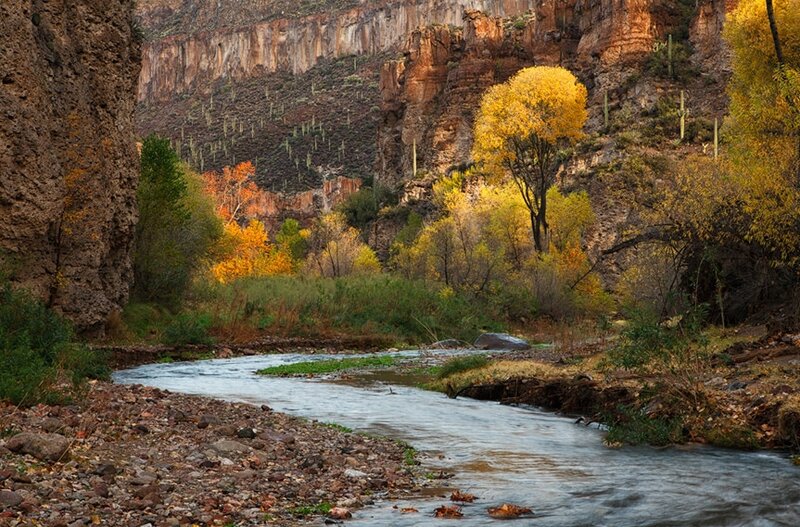 Aravaipa Canyon is also considered the best native fish habitat in Arizona with seven species of fish. We will be entering the wilderness area from the West trail head. There is a restroom and map at the trail-head. From the West trail-head it is approximately a 5 mile hike to the recommended camping area near Horse Canyon. The entire length of the canyon is about 11 miles. Due to the presence of bears and other large mammals in the area. It is advised to store your food in a bear canister or hang your food in a secure container away from camp. There is no actual trail leading through the wilderness. We will spend much of the time hiking along and through the creek. The water will be cold so plan accordingly. Always be alert and watch for snakes and other potentially dangerous wildlife. The temperatures generally range in the 70’s during the day and the 50’s at night in October. Sudden changes in water clarity from clear to muddy. Wear sturdy shoes!!! The hike through the canyon requires a lot of creek crossings, wading through water, and balancing on slippery algae-coated rocks. Canyoneering boots with good ankle support paired with neoprene socks are best. Inappropriate footwear often results in crushed toes or twisted ankles. The water level should be about mid-calf for most of the hike. Bring a good sturdy hiking stick!!! A good sturdy hiking stick will help tremendously with keeping your balance while hiking through the creek. Trekking poles are not recommended as they tend to get caught between the rocks on the bottom of the river and pull apart or break. Clothing, the temperature can be cool and breezy so be sure to bring warm clothing to layer up in and as well as a change of dry clothing, especially for at night. The temperatures can drop down into the 40’s or even upper 30’s. Wool and synthetic fibers work best, avoid cotton. Hypothermia in the back country can be serious!!! Wearing dry pants or a wet suit is advisable. Be sure to waterproof your pack!!! Use dry bags for anything that you do not want wet. You don’t want to risk losing your footing and getting all your belongings and shelter wet for the night. Not only would this make for a very cold night but the added water weight will also make carrying your pack much more difficult.